Angels’ Place is the heart of The James Connetion. It is a home and a loving Christian environment for orphans in Churachandpur, a town about 30 miles south of Imphal, the capital city of Manipur, a state in the northeast panhandle of India. 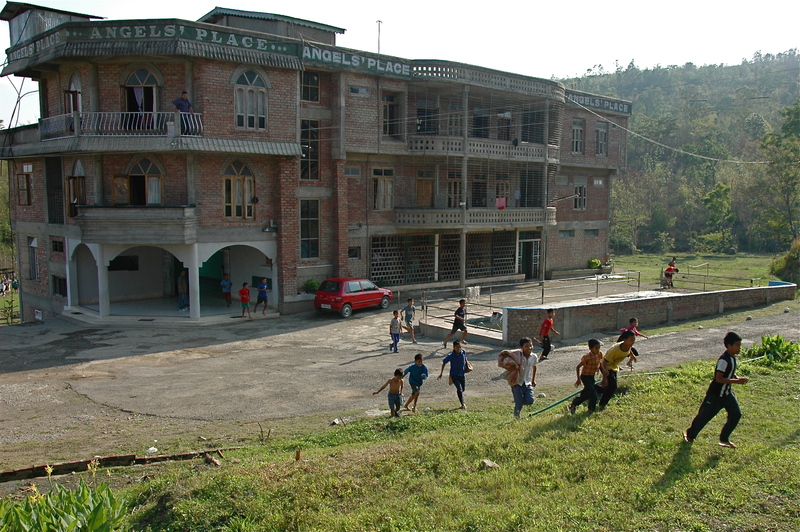 Angels’ Place began in 2004 as 8.5 acres of rice paddies in the beautiful foothills of the Himalayas. The James Connection bought this land and built a two story dwelling place for an initial 60 children who took up residency on February 7, 2005. As word spread, the waiting list grew too! In 2006, 15 more children moved in. In 2007, with the construction of another floor, 50 more children joined the Angels’ Place family. As our numbers swelled it became obvious that we needed a second building and the girls called out for a dormitory of their own! That started out as a one story multi-purpose building and is now complete with three stories that not only provide living quarters for the girls, but also space for study, indoor recreation and assembly. During our tenth anniversary celebration in 2015, we dedicated Lydia's House. The rest of the property at Angels’ Place is used to support and enrich the lives of the children. Aside from generous playing fields where kids get plenty of physical activity, the area is fully cultivated with banana trees, rice paddies, and vegetable gardens. Children help with farm chores and they help raise pigs, cows, chickens, and even fish. Any patch of land not conducive to sports or food is planted with beautiful flowers that bloom all year round. The current enrollment at Angels' Place is over 150 children. Sadly, the waiting list is longer than ever. See the Kids in Action! Watch this wonderful video of some of our kids singing at Angels' Place. They are amazing! There are hundreds of children waiting to find a home at Angel's Place. There are several ways to help us make room for them. Please visit our Ways to Help page to learn more.